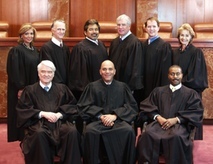 TEXAS DEPARTMENT OF INSURANCE v. RECONVEYANCE SERVICES, INC. This case was pending on merits briefs between August 11, 2009 and February 9, 2010. This case was waiting for a decision about briefing or a possible grant between June 6, 2008 and June 12, 2009. This case was waiting for a decision about briefing or a possible grant between March 7, 2008 and June 6, 2008.